Go North East has pulled out all the stops to celebrate Sunderland’s most popular local radio station, with the gift of a branded bus at two major events this month (May 2017). 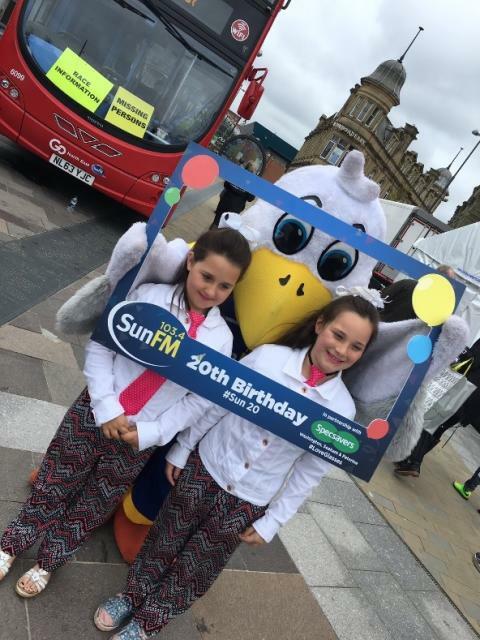 Rolling into Sun FM’s 20th birthday bash at the city’s Keel Square, the state-of-the-art double decker acted as the centre point of the party, which attracted thousands of visitors from across the region earlier this month (7 May 2017). Coinciding with The Siglion 10k and Half Marathon events - which saw a record turnout of 4,000 people taking part, Sun FM’s milestone festivities delivered an action-packed line-up to entertain the crowds. Former JLS member, Aston Merrygold performed his new single to fans and up-and-coming stars from the Sunderland music scene showcased their talents. Famous faces from the world of sport were also in attendance. Olympic medalist Steve Cram led a special live Into the Light podcast with SAFC legends Kevin Ball and Michael Proctor, while world record holder Paula Radcliffe graced the stage with Olympian Ali Dixon after the pair went head-to-head in the race. At the epicentre of the event, the colourful Sun FM bus, manned by local Go North East bus driver, Steve Howe helped to provide information for visitors and a base for anyone separated from their friends and family. To mark the celebrations, the region’s biggest bus company also held a competition for one partygoer to win a year’s free travel on any bus within the Go North East network. 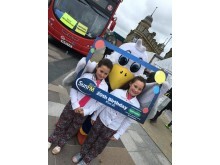 As well as supporting the birthday bash, Go North East’s Sun FM bus journeyed across every town and village surrounding Sunderland as part of Local Radio Day last Friday (26 May 2017). Steve was behind the wheel once again, transporting Sun FM presenters and station mascot, Sunny the Seagull to multiple locations where they met local listeners and handed out giveaways. Go North East’s branded bus is continuing to support the station in a year-long partnership with Sun FM’s Street Stars ground crew. Travelling aboard the bus to some of the biggest events in Wearside’s calendar, the crew is now able to extend its reach further afield throughout the year.